The buzz of thousands of honeybees gathering nectar to deliver to their hives is one of my favorite seasonal experiences. 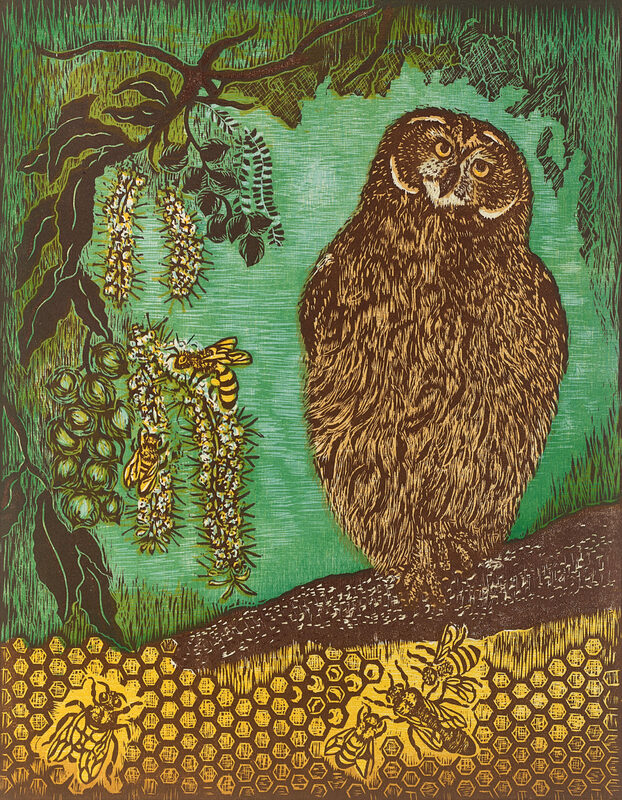 This original woodcut print captures the muted atmosphere of the orchard with the Pueo as quiet sentinal. Pueo is the Hawaiian native owl that hunts and nests in a variety of ecosystems ranging from forests to grasslands. The life of honeybees is depicted in the hive with the female workers attending the large queen alongside the larvae growing inside the cells. The male drone’s purpose is to mate with the queen once, which ends his life. Until that fateful moment he can often be found in the hive, but the worker bees will force him to leave if resources get low. This is a multiple-block original woodcut printed on a handmade paper. To learn more about Big Island Bees visit bigislandbees.com.